When I started researching for the best sewing machine reviews, I thought that I would only find 1 or 2 different features on each unit that would stand out. That couldn’t have been farther from the truth as each brand has its unique history and ways of bringing modern technology to the traditional art of sewing. Sewing machines are a great way to save money on new clothing and also learn a unique and marketable skill. Technology has added some new features to sewing machines like exact stitching and hundreds of different stitching options that can be chosen with just the touch of a button. If you are always at a loss for something to wear or you regularly find yourself thinking that you could design a better outfit, then buy a sewing machine. There are a lot of sewing machines available in the market today. Find which one is right for you. 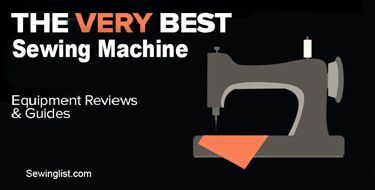 The following is a detailed review of some of the best-rated sewing machines on the market today. This should give you an indication of what you are looking for when deciding on the best one for you. At the end of this review, a clear winner will emerge. It’s your turn to find the top 10 sewing machines. 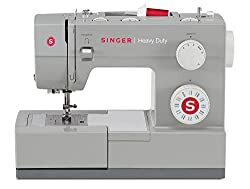 The Singer 9960 is one of the great machines for making clothes on the market because of some features and the quality of the product.I like the fact that this device has 600 different stitching possibilities because it means that no matter what project you decide to try, this unit will be able to accommodate. This feature guarantees you will always have an exact look you want with your stitch pattern. The singer has been making sewing machines since 1889, so few manufacturers know more about this product. This particular unit is a little higher priced than other sewing machines in this category, but the reputation and history of quality mean that the extra money won’t go to waste. The size of this sewing machine is another perk when you need to be able to pack up and go. The unit comes with a hardcover for transporting the device with little risk of breaking it. The extra extension table that in included ensures that you won’t need to struggle with larger jobs when they come up. I think it is a good sewing machine for making clothes. This sewing machine is also good for leather. This versatile sewing machine is equipped with 18 presser feet – capable of dealing with any and all sewing projects. The Singer 9960 is equipped with stitch editing capabilities so no need to worry about making a mistake with a stitch on garments. The automatic needle threader and thread cutter save time and frustration, especially for beginner sewers. Selection between the 600 built-in stitches is easy with the select stitch button. Buttonholes are no longer a problem with this machine as it is capable of 13 fully automatic 1-step buttonholes. Sewers will never have to stop their project to manipulate or move the fabric with this feature. The Singer 9960 also has a drop feed, so sewers can free-style their stitches and add embroidery and other decorative designs and details to projects. This unit is one of the best machines for making clothes because of features like the free arm that is built-in. This arm is perfect for sewing sleeves and cuffs, and the huge LCD screen makes it easy to switch stitches. The CS6000i also comes with nine included presser feet and over 30 optional accessories available. The attachments will give you the option of sewing the most intricate of clothing to using the ‘free motion quilting foot’ for those fun quilting projects you have been needed to try. One of the features I like on the Brother is the portability and the hard case that comes with it. You will appreciate this feature if you are using your sewing machine for a class or your job, but you still need to be able to bring it home with you. If you need to do a more extensive project like a blanket or dress, then the unit comes with a more substantial table to make this easier. Brother is well known for affordable and well-made products so you can feel confident when you buy their products. The 6000i may not have all of the bells and whistles of the most expensive sewing machine, but it gets the job done and is an excellent value for the money. The LCD display of this sewing machine has a clear screen that makes selecting stitch styles easy. A variety of stitch styles allows users to use both quilting and sewing features. Switch between the 60 built-in sewing stitches to create decorative styles from fashion sewing to heirloom to crafts and everything in between. Sewers save time with an automatic needle threader and an easy bobbin winding system, so thread won’t get bunched. Focus on the work at hand with a brightly lit LED work area. The Singer 7258 is an award-winning sewing machine that Consumers Digest deemed the ‘best buy’ based on eight different categories. This is why their units are usually considered to be the top rated sewing machines in the market. 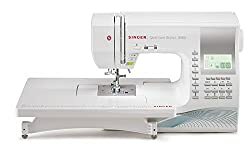 The Singer comes with 100 stitch choices built-in, so whether you are a hobbyist or just starting out, this machine is versatile enough to keep up with your needs. One feature I like on this device is the “automatic needle threader” which guarantees that you never have to struggle with threading again. This unit comes with “Push-Button Stitch Selection” which gives you the ability to choose your stitch quickly and easily with just the touch of your finger. There is an automatic setting for any requirements that stitch requires like length, tension, and width, so you don’t need to worry once you choose. Ten pressing feet are included with the price of the Singer so you should be able to find one that suits every project. There are quite a few additional accessories that you can purchase if you need to, but the package that comes with this sewing machine is pretty complete for most sewers. Another great feature of the Singer is the instructional DVD that comes with it which allows you to see the device in action and how each element works. This heavy-duty manual sewing machine is the work-horse of this category featuring a sturdy metal chassis and stainless steel sewing plate. This is the best sewing machine to buy if you are in need of a reliable piece of equipment that is stationary. If you need to carry your sewing machine around a lot, then this may not be the one for you because the solid construction makes it heavier than other machines. However, if you are looking for a dependable machine without a lot of bells and whistles, then the 4423 will do the job in half the time and with double the quality than most. Featuring 23 stitch choices, this machine will be versatile enough to handle projects ranging from clothing repair to quilt-making. Most sewers only use a few stitches religiously, and the speed of the machine will more than make-up for the lack of 100s of elegant stitching choices. One feature on the Singer machines that I like is the automatic needle-threader. This saves so much time and frustration in trying to do the threading yourself especially if you don’t have the best eyesight. No more squinting as you try to focus on a tiny little threading hole. One of the fastest sewing machines on the market, the Singer 4423 is capable of 1,100 stitches per minute. With the motor that is 60% stronger than a standard sewing machine, the Singer 4423 works with heavy duty fabrics such as canvas and denim in a flash. Easily install a bobbin with the top drop-in motion. The heavy duty frame and stainless steel bed plate makes the manipulation of fabrics (both light and heavy) easy allowing for precise stitching. Various projects can be completed with this machine as there are 23 built-in stitches can be used for home décor and garment construction. The company is so named because the founder started using a round metal bobbin instead of the old style extended system and thought it looked like a snake’s eye. The company is known for innovation and quality and many ‘firsts’ in the sewing machine industry. This is the reason why it is one of the best selling sewing machine manufacturers in the world. This Janome sewing machine comes with 30 stitches to choose from which should have you covered for any job you want to do. The two presser feet it comes with snap-on feet pressers which are easy to use, so you never have to struggle with changing attachments. The Janome 8077 comes with an impressive number of additional accessories that you can purchase.It’s top of the line sewing machines. The price of this unit is one of the highest in this category, but the history and innovation of the brand name put it in the running for one of the great machines to buy. The feeding system on the Janome is excellent for different thicknesses of materials. I like the fact that you will never have to worry about your more difficult projects snagging and getting ruined. If you need to switch a stitch quickly, then the digital display is easy to read and navigate with one hand. This sewing machine is great for monogramming because of the 55 ‘alphanumeric’ stitching options. The unit is lightweight and portable, featuring an extra wide table for larger projects that require a little more room. You will want to get some carrying case with it, however, as it does not come with one. It does come with a built-in handle which makes it a little easier to move around. 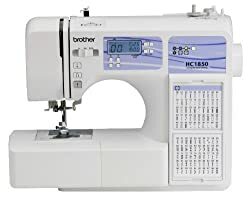 The Brother HC1850 is a computerized sewing machine which allows you to choose from 130 stitching options with just the press of a button. It also comes with a built-in chart to reference didn’t stitch types if you have any questions about them that can be found on the front of the machine. This unit is on the lower end of the price range in this category and is an excellent portable sewing machine for a beginner or a student who doesn’t have a lot of money to spend but wants a quality, versatile device. The high-quality feed system allows you to sew on the most delicate of lace to the thickest of flannels with ease and no snagging. 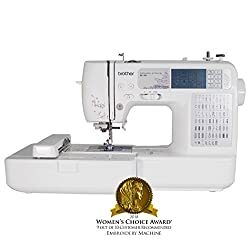 This device is part of the Project Runway line of units that are portable, easy to use one of the top ten best sewing machines for making clothes on the market today. The 70 stitch selections that come with the Brother can cover any project from detailed stitching on a pair of skinny jeans to an intricate quilting stitch. One feature on this machine that I like is the seven specialized feet for buttons, hems and other intricate tasks that come with sewing clothing. There is also an extra spacious table thrown in to help you sew larger items like dresses and blankets. 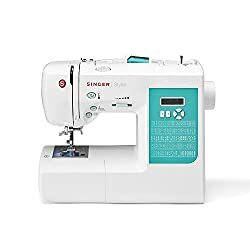 The cost of this sewing machine is right in the middle of other units in this category, which makes it a grand value for the features it comes with. With simple one-touch settings on the digital display, you can comfortably switch stitches in the middle of a project with one hand without skipping a beat. This is also a portable unit, so if you need to move it from one location to another, it can be done with ease, although you should get a carrying case as it doesn’t come with one. This lightweight machine is great for portability. The Brother Project Runway sewing machine is equipped with a detachable wide table so larger projects are no problem to be tackled. With 110 stitch functions constructing garments, quilts, or heirlooms is no problem as the stitches can be selected easily from the LCD display. Sewers will enjoy a variety of stitch styles as 70 built-in stitches can be selected on this machine. Time is of the essence and will be no problem as the automatic needle threader will enable projects to move forward swiftly and precisely. The SE400 is a great sewing machine for embroidery as it comes with 120 pattern combinations and 70 embroidery designs that can be chosen with the touch of a button. There is also computer connectivity which allows you to download thousands more on iBroidery.com. The touch-screen display is large and easy to use as a reference guide and various language choices. This machine also comes with five fonts for easy monogramming opportunities. There is also an automatic threading function as well as a thread cutter that can be accessed by pushing one button. I like that these roles can be done with one hand so you can continue to hold the fabric in place and not risk ruining the project. The price of this unit is on the high end because you are getting the benefit of being able to download from the computer. This turns your sewing machine from a static unit that can only do so many stitches to an unlimited creativity machine with thousands of choices. There are also many resources and tips online that will help you get the most out of this sewing machine. You can also download upgrades for your machine as they become available. Embroidery designs are no problem with this machine as it has 70 built in designs that sewers can choose from. Choosing from these built-in designs guarantee precise and efficient stitches so that projects have a professional quality. The Brother SE400 is technologically advanced and can connect with a computer to download embroidery designs, as well as update the machine. Sewers can also enjoy iBroidery.com and select between thousands of embroidery designs. This unit is one of the top-selling sewing machinesout there, and the reason is versatility and quality. The Brother comes with over 67 stitching choices that can be chosen by using the simple computerized technology. The “Brother My Custom Stitch” system lets you get as innovative as you want by creating your custom stitching easily and quickly. One of the things I like about the Brother LB6800PRW is the quality of the feeding system which is excellent for any thickness and texture of materials you need to sew. You also have the convenience of technology that allows you to sew without the foot controller if you have issues with your feet. This sewing machine is on the higher end of the price range in this category, but the extra features and available technology make it worth the money. This sewing machine is lightweight and easy to carry in the hard case that comes included in the price. It also comes with 11 presser feet for a wide range of projects, and you will never be squinting at your work with the dual lighting system. 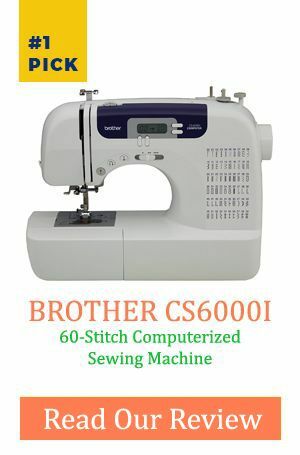 Brother is a reliable brand that has been making sewing machines since the early 1900s, so the reliability and experience show in their products. Its one of our top sewing machines. This high tech sewing machine has the capability to import designs directly from a computer in addition to the 70 built-in embroidery designs on the machine. Creating garments and various projects are easy with this feature as the details and designs can be created precisely. Switching between the 67 built-in sewing stitches is a breeze with the touch LCD screen display on this machine. A built-in push button thread cutter makes reinforcing stitches a breeze and adds a polished finish to the final product. The Juki is a great little budget sewing machine that comes with some great features for an affordable price. This is also one of the few manual units mentioned in these reviews on sewing machines with a large stitch knob that needs to be turned on the side to choose one of the 22 stitch options. Juki Industrial sells units in over 150 countries world wide is ranked as the best manufacturer in the world of sewing machines. I think that is a real testament to the quality of a Juki product when you purchase it; you know that it is designed with you in mind. 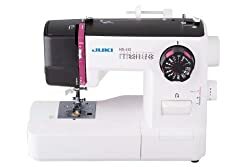 The Juki 27Z is meant to be a starter or kids sewing machine with a great price and versatile features that are easy to learn on but also will satisfy any light project you might need to do. It is not as easy to use as some of the others for a beginner, so you may need to do some practice runs before embarking on any serious work. The quality of the feeding mechanism will sew a range of different fabrics quickly and easily. That’s why its take place on our top 10 sewing machines. Cuffs, sleeves, and pant legs are no match for the Juki sewing machine as the accessory table can be removed to allow free form sewing. A large dial making selecting stitch patterns a breeze. Never worry about needle bunching as the drop-in bobbin is easy to install and easy to keep an eye on while sewing. The 7 point feed dog makes larger projects a breeze as material can be manipulated in a variety of ways. You’ve just observed that advanced sewing machines have a considerable measure of features to offer. It isn’t cared for in the conventional circumstances when a sewing machine was deliberately made for apparel making. With the brands and models we’ve depicted in our audit, you can play out an assortment of errands with only one basic machine. They look basic, but they convey complex plans, art, and beautification if just utilized legitimately. No compelling reason to squander additional time thinking about the correct speculation for your dollars, the above rundown combines the best at an affordable price. If you are using your sewing machine for casual stitching like patches or ripped clothing, then your needs are going to be a lot different than if you are making clothes for sale or even for personal use. The majority of sewers will use two stitches 99% of the time, zig zag and straight stitch, the rest of the stitches a sewing machine comes with are a nice bonus but probably won’t be used very often. The type of feet that comes on a sewing machine is necessary depending on what you decide to sew. Your feet presser will be very different if you are sewing clothing than if you are sewing a quilt. If the machine you are looking at doesn’t come with the feet you are looking for, then see if they are available separately. It may be less expensive to purchase additional accessories for the base machine than buying one that is higher end. If your sewing machine needs to be portable, then size and weight are important features to take into consideration. Some units will come with a carrying case for easy portability. Sewing machines are one of those items where the manufacturer needs to have experience and skill in making a quality product. You can have two machines made by two different companies that cost the same. If one has all the bells and whistles but is cheaply made, then you will end up having to replace it and wasting your money. The other could be a straight-forward with the features you need, but not much more in the way of features, but because it is so well made, it lasts forever. More features don’t always equal the best machine, and customer reviews are an excellent way to tell which is worth the money. If you are on a budget, then making a list of must-haves in a sewing machine is the best route to go before buying one. If you are making quilts for resale, then you must have specific features on your device. When you buy a machine, always make sure you have the best of the essential element and spend your money on the machine that concentrates on that. Where are you buying it? – Sewing machines are better to buy from stores that specialize in them and give you the opportunity to try them out. Noise – Are you using it in an apartment where your neighbors may not take too kindly to living in what sounds like a construction site? Computerized or manual – If you are looking for a sewing machine that has hundreds of different stitching options, then an automated may be the way to go, but that feature will cost more.